This page is a big picture nursery room guide to help you to find your way around this site and to get your thoughts in order before you begin nursery decorating. Each step of the guide is dealt with in detail under the relevant section headings on the left navigation bar. But read the baby nursery design guide first. It is packed with vital information for getting your nursery decorating project off on the right foot. Make yourself a lovely hot cuppa, beg, borrow or steal a muffin (from hubby maybe?) and come with me as I outline the main baby nursery design steps! You can save yourself plenty of headaches and stress, not to mention money, by planning your nursery room design before you start decorating. Your top priority in designing any little person's space should be safety. If this is your first baby, you are used to thinking about the world from the perspective of someone much bigger - you! Things that are quite harmless for adults, can be a minefield of danger for someone who, at birth, will quite comfortably nestle in a space the size of your hands. Without being paranoid, you really do need to start looking for danger around every corner, and bear your baby's safety in mind through every step of the nursery room design process. Think small and fragile. Check out my complete nursery safety checklist to find out everything you need to know about how to protect your baby in the nursery. 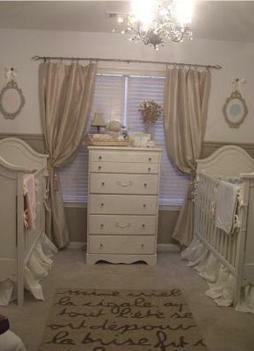 Next, your nursery should be as easy and pleasurable to use as it is beautiful. We've all seen photos of those picture perfect designer nurseries, and they look great, I admit. But many of them just aren't practical. My baby would pull this place apart in five seconds flat! Make sure you create your baby room design with practicality in mind. Step 1: Look at as many pictures of baby rooms as you can find. Visit the baby nursery blog for daily inspiration. Step 2: Choose a nursery decorating style. Step 3: Choose a nursery theme (optional). Step 4: Finalize a baby nursery color scheme. If you're having trouble getting started with your baby room, don't miss my Step by Step Nursery Design Guide. One at a time I'll take you through all the decisions you need to make in order to arrive at the best baby room design for you. Step 5: Choose a baby crib or a small baby bed. Step 6: Find complementary baby nursery furniture. Step 7: Select a nursery lighting option. Step 8: Decide on the best baby nursery flooring for the room. If you are expecting more than one, click here for baby room ideas for multiples. Now that all the practical stuff is out of the way, it's time to move on to the fun part of baby nursery design. Step 9: Find the best nursery decor suppliers. Step 10: Decide how to paint the room. Step 11: Select and install your nursery lighting fixtures. Step 12: Choose and hang your nursery curtains. Step 13: Move in - bring in the furniture. Step 14: Shop for the perfect baby nursery bedding. Step 15: Add a great nursery rug. Step 16: Finish off with nursery wall decor and accessories. Time to go shopping again. This time for tons of great baby nursery stuff. I know you skipped ahead and covered most of this nursery room design step already! But, believe it or not, the best thing about equipping the baby nursery isn't the shopping, it's packing all those tiny little things into your brand new drawers and baskets! So the best is yet to come - get packing! Check out our baby gear section, as well as, this complete baby layette list. There are many more articles to come so check back often or sign up for my baby nursery blog for instant notification every time a page is added to this site. Need help organizing, cleaning or finding great storage ideas? Go to www.straighten-up-now.com for help organizing your baby nursery and the rest of your home. There is much more to preparing for baby than decorating and kitting out your nursery. Getting ready for the arrival of your little one is an exciting and scary time, especially if it's your first. You have no idea what to expect or how completely your freshly born bundle will turn your life upside down! Fortunately, a little preparation goes a long way towards smoothing the path that lies ahead of you. Having a few good baby books to refer to is an essential sanity saver. As a new mom you will find yourself worrying about everything from sleep and crying, to fevers and choking. Browse my recommended baby care books and get a few for your bookshelf - having expert advice at your fingertips will put your mind at ease! On this site we also have the top 100 baby names to help you with this most complicated of tasks, as well as, a collection of baby checklists to help you to prepare yourself and your home for your new arrival. And even before your baby is born, you can start preparing by browsing the thousands of baby care tips and advice available at Easy Baby Life. They provide useful tips and advice from pregnancy through out your baby's first year. Again there is much more to come so stay tuned. In the meantime, click here for some indispensible preparing for baby tips from a mom of four!